Money lending is the primal principle of any functioning economy. The blockchain technology has the potential to completely upend the way loans function in today's world — heads up, it's far better than the traditional system. 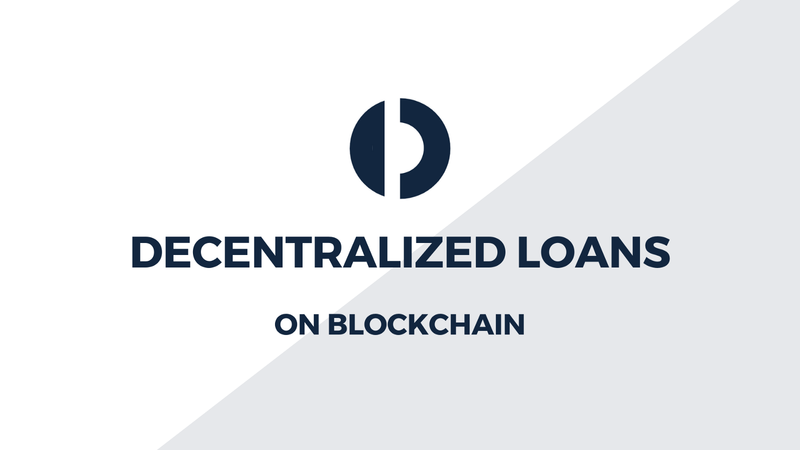 In this article, we will understand why decentralized loans will escalate in the future. Have you ever wondered how much your bank charges you for loans? When you fill out an application for a bank loan, the bank has to evaluate the risk that you won’t pay them back. They do this by looking at factors like your credit score, the debt-income ratio etc. Based on this information, banks price the risk of default into the fees and interest collected on loans. Once we’ve been loaned, banks charge about 5–8.5% interest rates. Traditionally, the entire application, approval, and funding process typically takes about 7 business days (∵ banks don’t operate on Sundays or public holidays). Not to forget, personal loans charge not less than 12% to 36% interest annually. Unless you’ve been living in a cave since 2009, you know what Blockchain is. The world of blockchain is moving rapidly and especially Ethereum, despite having its ups and downs. What if I told you, that you can use the $1000 you have in Ether and to get $500 more! Yes, with a 1.5% interest in just a few minutes. This is happening. So how are decentralized loans better than traditional loans? Traditional Loans: You apply for a loan (once you’re ≥18 years old), with something valuable as collateral eg. a house. Provide private information such as name, address, workplace etc for records. It takes about 7 business days for your loan to get approved. Once approved, you will be charged 8–12% annually. Decentralized Loans: Connect to your ethereum address (you don’t have to be 18). Lock your ethereum in the smart contract as collateral. Once your transaction is successful (which takes about 2–3 mins), you can then generate DAI which will be transferred to your ethereum address. You will be charged 1.5% interest whenever you payback your loan. Blockchain technology offers a high-security, low-cost way of sending payments that cut down on the need for verification from third parties and beats processing times for traditional bank transfers. 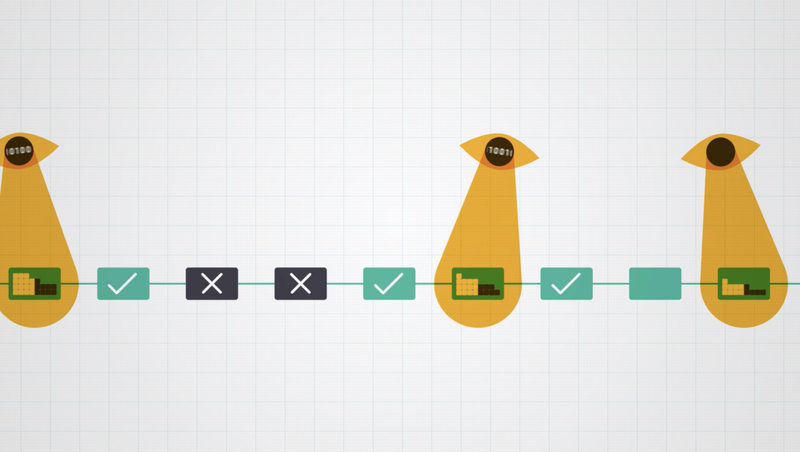 In this new financial system, you don’t trust humans, you simply trust the algorithm. You’re only interacting with smart contracts running on the blockchain. All you require is a web3 client, such as Metamask. MakerDAO created this thing we call a CDP (Collateral Debt Position). 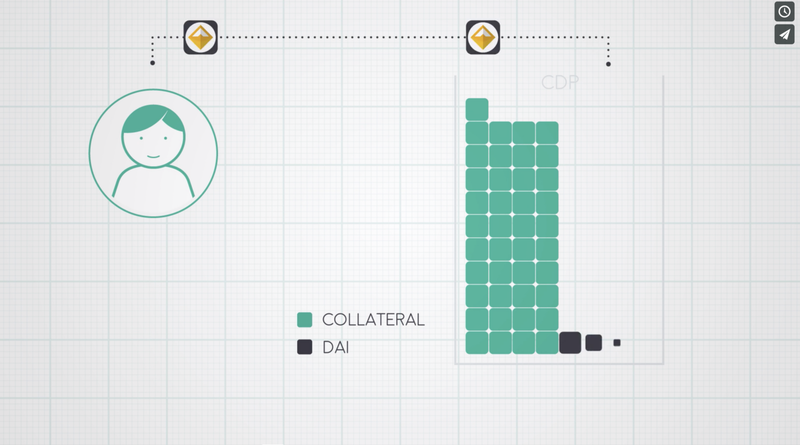 When you lock a certain amount of ETH, you’re allowed to generate 2/3rd of the collateral value (ETH), in the form of a USD pegged DAI Stablecoin. How is DAI a stable coin? The DAI stable coin is a MakerDAO product. DAI is fully decentralized, eliminating the need for a third party and offers a stable coin system that is fully backed by the Ethereum platform, MakerDAO whitepaper (highly recommended read). The stakeholders are incentivized to stabilize price whenever DAI is above or below $1. Open InstaDApp, Connect to your Metamask account or use the inbuilt Metamask integration for hardware wallets (Ledger or Trezor). 2. Deposit the amount of Eth you want to lock as collateral. 3. Generate the amount of Dai you wish you generate as a loan. Make sure it's below 50% to avoid risk. 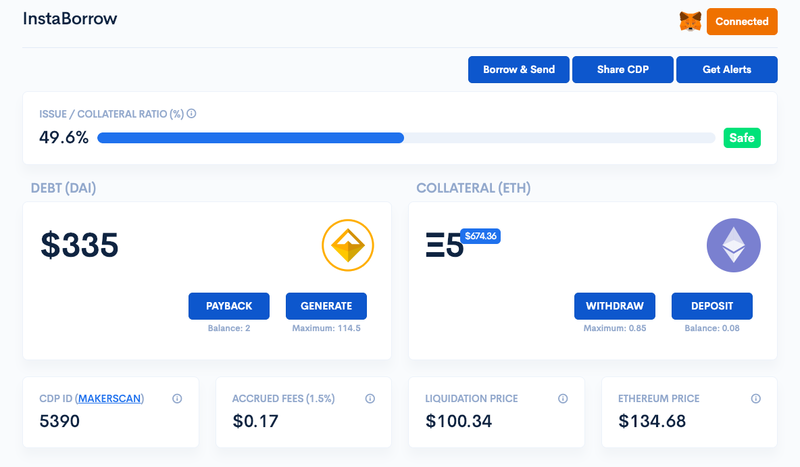 If your ratio goes above 66%, your collateral (ETH) is automatically sold to pay your debt (DAI). So if ETH is $100, you can withdraw~66 $DAI as a loan (which is 2/3 of the collateral value in USD). You can also go onto MakerScan to view the stats of your CDP and also set Telegram and/or Email Alerts in order to keep track of your CDP. Note — Make sure you have enough Ethereum in your Metamask to process the transactions. 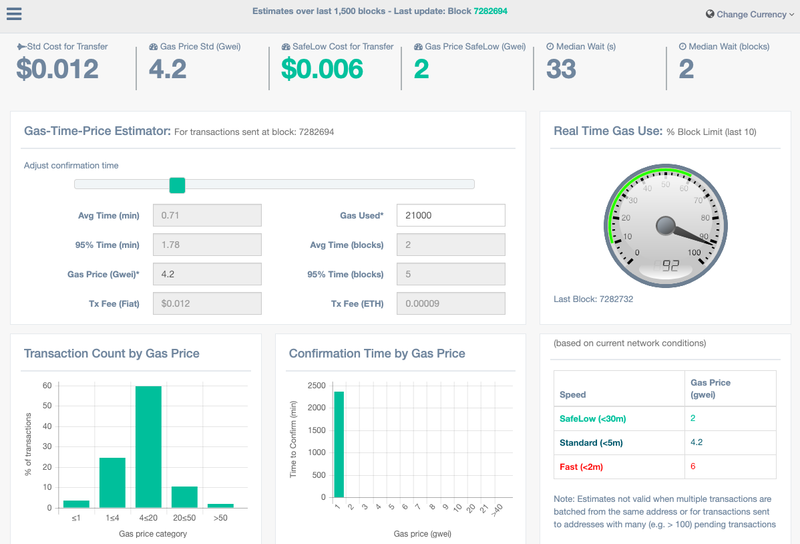 The transactions are processed with a particular gas price (Gwei) which is normally within $1. This is known as the transaction fees every user is required to pay. EthGasStation always has up to date Gwei prices. There you go, you just loaned yourself money in 2–3 mins with less than $1 as the txn fees. The Peer-to-Peer process eliminates several bureaucratic processes that centralized banks need to go through when approving a loan. There is a particular stability fee of 1.5% that has to be paid in MKR in order to create a CDP on the MakerDAO protocol. But with InstaDApp, the stability fee is paid in ETH which is internally swapped with MKR eliminating the hassle for users. Keepers track the risky CDPs to liquidate. With blockchain, it does not matter whether you have a negative credit score, as long as your CDP is backed with enough collateral because if not, you will be liquidated automatically if the issue/collateral ratio goes above 66%, which means you’ll lose your money. Simple. You’re your own bank. Now that we’ve generated DAI, what do we use it for? Users can deal with the system in diverse ways, opening opportunities for both profit-seeking traders and stability-seeking HODLers to participate in this decentralized ecosystem. Once Dai has been created, it can be used just like any other ERC20 token. You can swap it with any token you wish on Easwap. One of the primary use cases of CDPs is margin trading by CDP users. So, you swap Dai with Eth and then lock the Eth to generate more Dai and then repeat again. You can always convert DAI to ETH and then sell your ETH at LocalEthereum for a good rate. More DAI user stories depicted here. The blockchain is still in its infancy, but it is slowly advancing and revolutionizing a lot of sectors in the world, starting with how we operate our finances. 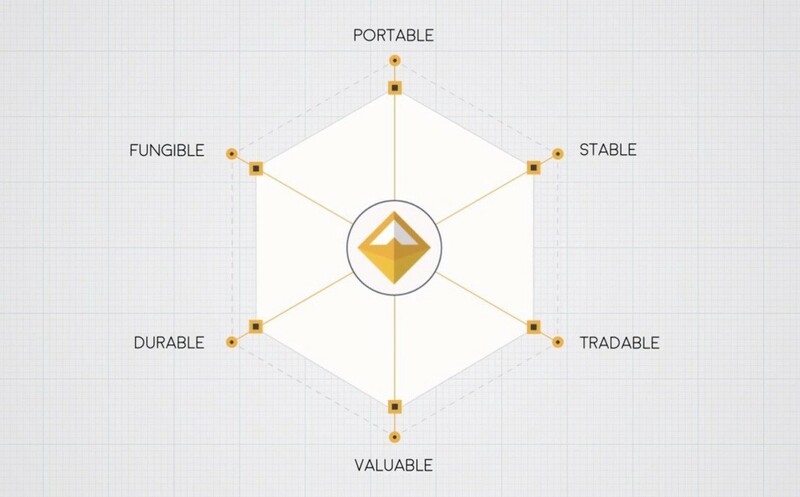 The DAI Stablecoin based on the Maker Platform has led its way to become the backbone of the crypto world, with its decentralized nature and its ability to remain pegged to the USD, will slowly but surely replace fiat currencies. InstaDApp is envisioned to build a mashup of all the segregated protocols and to build a banking entity around it by grouping them all. Stay tuned for more.